Bread is much more than bread. Since thousands of years it has been the symbol of food, physical and spiritual power, life-force. This is expressed e.g. by the prayer "Give us this day our daily bread" (Matt 6:11), by the Lord's Supper: "And as they were eating, Jesus took bread, and blessed it, and brake it, and gave it to the disciples, and said, Take , eat; this is my body" (Matt 26:26) - and by goals and names of associations like "Bread for the World". Bread is made from cereals. It was the cereals, which allowed mankind to grow to the present huge population of living individuals. This has been proven by natural science as well as it is biblical order: "And God said 'Behold, I have given you every herb bearing seed, which is upon the face of all the earth, and every tree, in the which is the fruit of a tree-yielding seed; to you it shall be for food*)'" (Genesis, 1.Mose 1,29). *) When I got the American Bible translation of this sentence, I was shocked, finding the word "food" being replaced by the word "meat". Already by a logic question, doubts about a correct translation raise: If God would have created man as a meat-eater - why He should give seeds, saying "to you this shall be for meat"? (Even to the lion He didn't do this). In the German translation of the Bible this word is translated into "Nahrung" (food, nourishment, nutriment). In the Ethiopian translation (Amharic language) a word is used, which means translated into English "Food" (=food in general, without specification of it's type or composition). When going to the source itself, the old Hebrew original text (see e.g. Biblia Hebraica Stuttgartiensa, 2nd Edition, Volume I Genesis, 1989, Haeussler Edition, Neuhausen-Stuttgart), the word is in German "Speise" (food, fare), which is also a neutral word for food without specification of it's type or composition. In fact, God has created man as a fruit-eater (seeds, roots, soft leaves). This is as well His words in the original Bible text, teaching how He has created and organized life and food on earth, as it is a scientific result e.g. of the "Comparing Anatomy of Dentitions" (Dr. Richard Lehne). This "small shift" from using the right word food to use the incorrect word meat, has contributed to make complete nations suffering from chronic diseases and degeneration. Words are programs. Wrong words cause wrong programs. Wrong programs produce negative results! These "every herb bearing seeds, which is upon the face of all the earth" are the grasses. Only grasses are growing all over the earth in each elevation and climate. Even today a grass seed, T'eff, is the basis of the daily bread, where probably the cradle of mankind was standing: in Ethiopia, Africa. From T'eff the Ethiopian flat bread, Enjera, is made. From grass seeds mankind has developed all cereals by selecting and cultivating: spelt, emmer-wheat, wheat, rye, barley, oats, buckwheat, millet, sorghum, amaranth, rice, maize and other food crops and varieties. Seeds like grains of cereals are "living preserves", which can be cultivated, harvested and stored in huge amounts. This does not only allow to bridge over the cold, fruitless winter season, but even years of crop failure, by intelligent management of storage. This was known already by Joseph, the governor of the Pharaoh in Egypt. Joseph was able to interpret the dream of the Pharaoh of the seven fat and seven meager cows - as coming seven fat and seven meager years. Joseph ordered to built up a huge reserve of cereals during the seven "fat" years. So the population could be saved from starvation during the seven "meager" years. Only based on cereals in this way, drastic decimations of mankind by droughts and crop failures could be avoided. That's why mankind could increase to impressive population of about 6 billion individuals. These seeds and cereals have an other advantage. They are containing - like no other foodstuffs - most of the active agents, sources of energy, genetic information and biochemical tools, which are necessary to develop new life. This is used by a lot of very different higher animals, not only by man. In the stage of development from fecundated ovo up to adult organism, these active agents (vital substances) are used for augmentation of cells, development of organs and growth. In all ages of adult life they are used (and needed) for permanent replacement and rejuvenation of cells, organs and structures. So long as humans were maintaining this "Community of Life with the Cereals" (title of a book written by Prof. Dr. Werner Kollath, who explored these correlations), they were well off. But when humans renounced this "community of life" (or symbiosis) with the cereals, disaster took its course. They did it by only using the starch (extract flour, refined flour, white flour) to produce their bread, and by feeding the cereals to animals to eat their meat. With an "incubation time" of about 20 years (which was found by the English scientists T. L. Cleave and G. D. Campbell, published 1966, and called "the rule of the 20 years"), all the endemic chronic diseases and degenerations of civilization developed in the populations, no matter which race and continent. world production of cereals would be sufficient to supply each living human individual in the world of 6 billion per day with 1 kg of cereals, which is sufficient to bake 1.5 kg of whole-meal bread. This is very nutritious, maintaining health, and more than enough for 1 person; nobody, no child and no adult, would need to go hungry and suffer from malnutrition diseases again. But what is happening really? The larger part of the world harvest of cereals is fed to about 15 billion "useful animals" to eat their meat. Each single person eating so called "mixed food" (vegetables and animal food products), is eating up the food base of a complete family in a "developing country". The punishment is coming later, with a delay in average of 20 years: The person falls ill with one of the protein-mast diseases (so called and proven by Prof. Dr. Lothar Wendt, who was living and teaching in Frankfurt): Cardiovascular diseases like hypertension, heart attack, stroke; overweight, diabetes II, gout, polyarthritis, rheumatism, allergies, dysfunction of the kidneys, and more. When already the parents were eating "mixed food", it doesn't anymore take again 20 years; already the children then suffer from degenerations and diseases during their childhood. Any change or actions should not be expected from governments or "health"ministries. All of them, at least indirectly, are under influence of pressure groups (lobbies), who are interested to leave or even maintain the things as they are; see the essay of Prof. Dr. phil. Dr. jur. Erich Fechner "Economic Interests and the right of free expression of opinion in favor of public welfare, especially in questions of public health (only available in German language). Now - after you have found this information on the internet - you can use of your consumer's power, to change things to the better. When ever you are buying bread and bakery products, ask for whole-meal bread and whole-meal bakery products, made from freshly ground whole-meal flour. Insist on it also in hotels, restaurants, airplanes, diner-cars, university cafeterias, canteens, clinics and hospitals. The more frequently you do this, and the more people do this, the more likely and sooner something will change. Wherever the usual denaturated products and high quality whole-meal breads and products are offered, always the whole-meal products are preferred and sell out first. It is the dictatorship of the exclusively offered white flour products, which forces a lot of people to eat them, because there is nothing else available. Pay attention please to fresh grinding of the cereals for producing such whole-meal breads and products. Because only then the health-relevant vital substances, which are very sensitive to oxidation and enzymatic decomposition soon after grinding, are still contained in these whole-meal foodstuffs. After the baking process, because enzymes are deactivated, health value of whole-meal bakery products is maintained at least for 1-2 weeks or more (dependent on storage methods). 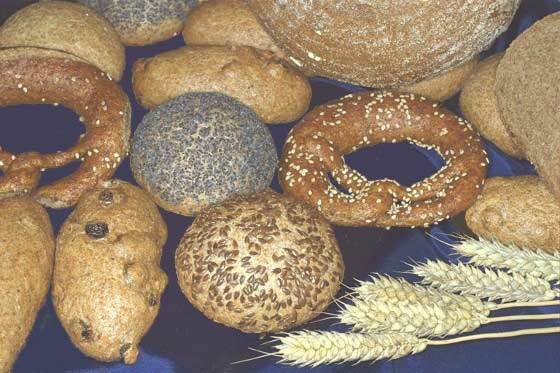 In the next document you will find the history of my recipes for whole-meal breads and bakery products, which will give you an idea about the "scenery" in the background. You can encourage your baker, to take a license of my recipes. You may print out these pages, to show him. He is not only doing a favor to you, but also a favor to himself, because success and prestige of him and his bakery will grow. Licensed bakers also get a place in my internet site to tell about their location and offers of such products. Using my E-Mail-Address, you or your baker could request for an information about the license agreement for the bakery (please give full addresses including fax and if available e-mail of you and of the bakery). By motivating your baker, you are doing something of high value for yourself, your family, your bakery and additionally for a lot of more people living around the bakery.